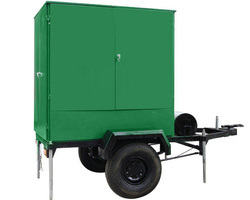 System is placed on a roadworthy, weatherproof single axle trailer and the system is designed to be operated and accessed from the outside of the trailer. To access and monitor components on the purification system, the trailer is equipped with lift-up rear door and side doors. The outer walls of the trailer/doors are constructed of white steel sheets to provide for a sturdy weather resistant trailer. An braking system is provided should the system break free from the towing vehicle.